The FaceApp is taking the world by storm. Instagram is flooded with people posting pictures of themselves looking older, younger, or a different gender. We totally get it. The FaceApp is addicting, fun, and super silly. Those are all those ingredients for a great, viral app. That’s why we’re loving this new, really creative use of FaceApp! 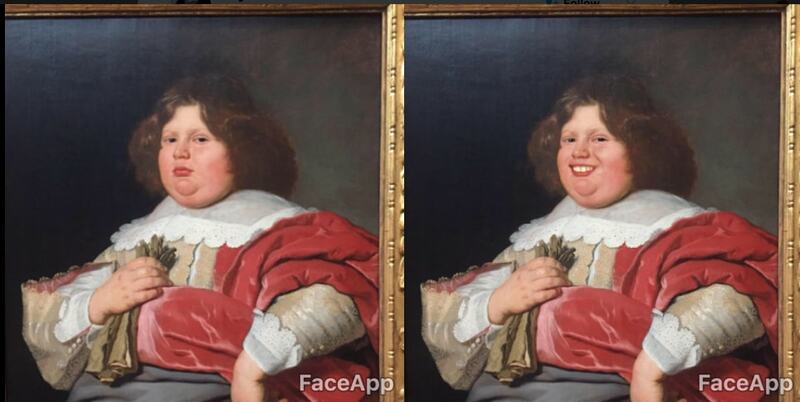 UK-based designer Olly Gibbs took FaceApp to an art museum to place smiles on all the grumpy old art subjects. To be fair, people frowned so much in old paintings, sculptures, and pictures because you had to stand still for ever! Even so, we’re loving the injection of enthusiasm into an otherwise serious setting. The post of course went super viral, because this is hilarious and amazing. The best part is a few days later Gibbs kicked it up a notch. He added dad jokes and made them into gifs, so it looks like the art is smiling after hearing a joke. The art may not actually be smiling, but now we certainly are! We would never have guessed we needed this in our lives, but we’re so much better off because of it. This is an incredible use of an already super popular app. Leave it to the internet to take something that is already goofy and fun, and somehow improve upon it. So be right back, we’re all hitting the museum!